dbForge Query Builder for MySQL is a visual tool that allows to create any sort of MySQL queries, from simple lookups to complex JOINs. The tool provides broad compatibility options and helps creating and editing complex MySQL queries in just a few clicks. You don't need to type any code at all - just "draw" your query on a diagram. When you need to type some SQL code manually, comprehensive suggestions will simplify the task. Simply draw your query on an elaborated diagram instead of writing code manually. Drag’n’drop required tables to the diagram, join them, and select columns visually. For better view, use zooming options. Manage complex sub-queries with visual query building tool for MySQL and MariaDB. Use the tabbed window to edit sub-queries in separate windows and easily access the main query. INSERT, DELETE, and UPDATE queries can be designed using dbForge Query Builder for MySQL. The query type is specified on the label of the diagram. Use this label to choose a table to work with. Automate your work with query criteria. See and visually edit them on separate tabs under the diagram. You don't need to type column names or remember complex rules. Just select the required data from the lists and enjoy results. Query building tool for MySQL will help you write SQL code yourself or modify the existing code. The tool suggests possible variants for completing words, shows information on database objects, and provides customizable profiles. Data management has become more convenient. Group, sort, and filter data in the grid. For better data view and editing, use various modes. Benefit from cached updates and print or export query results. Edit foreign keys directly in the data grid via Foreign key lookup editor. If you edit a table with foreign keys, just click the needed cell - and data of the parent table will be shown. Visual and accurate data export to widely-used formats: HTML, Text, MS Excel, MS Excel, MS Access, RTF, PDF, XML, CSV, DBF, ODBC, SQL. The export is customizable and allows using templates. 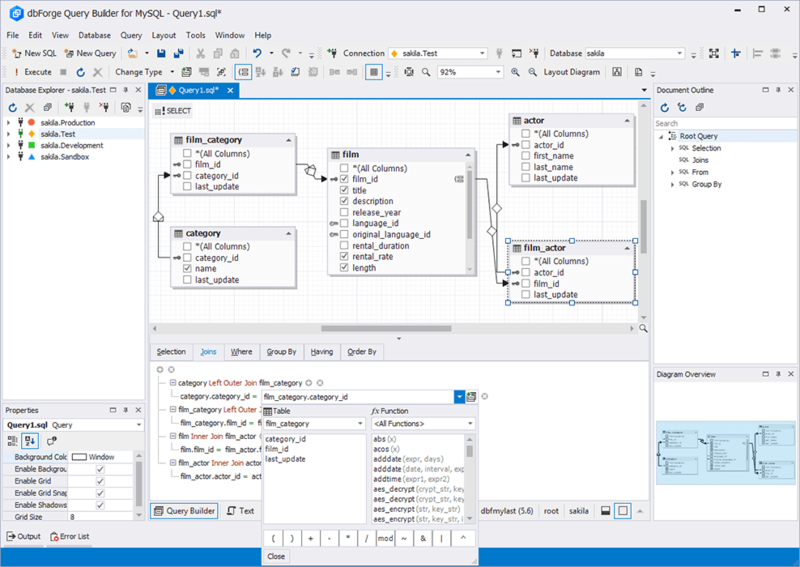 If you need query building features together with functionality for performing other database-related tasks, try out dbForge Studio for MySQL, Professional Edition — management and administration tool for MySQL. I really love the product, from my point of view a bit more focus on usability to manage, document and find your productfiles would be really great ! Now its a lot of grepping to find what You need on bigger projects. Thank you dbForge for this software, I've been looking for something that was fairly intuitive to use and robust, and so it looks like I have found it!